Inspiration for furnishing your home! An entertainment unit is more than just a case for your TV, media devices, books and artifacts. It needs to be functional yet stylish so that it adds to the overall beauty of your home. Choosing an entertainment unit is now a whole lot easier with the range of Parker House entertainment units available at Shop Factory Direct, the go-to online hub for buying home furniture and home furnishings. Parker House is a family-owned and operated brand creating thoughtfully-designed furniture for the last 60 years across the US and several international markets. The Parker House Entertainment Collection is mindfully crafted for media devices and offer an abundance of TV and storage space. They are cheapest on Shop Factory Direct and come with free shipping across the US. Some of the popular Parker House collections on Shop Factory Direct are Austin, Bella, Boca, Boston, Hartford, Venezia, Wellington, Tidewater and Savannah. Nothing looks more elegant than vintage white. The Parker House Hartford 48″-72″ Expandable Entertainment Wall Unit is flexible and functional. Short on space? Go for the Venezia Library 60″ Inset Entertainment Wall with Ladder in a vintage burnished black finish. This space saver accommodates TV models up to 60″, ample stereo cabinets, small drawers, and two bookcases. With the help of a ladder, you can easily access the myriad units of the unit. For an elaborate piece-de-resistance, the Parker House Traditional Library Wall HUN-PACK-N might be what you’re looking for. Its highlight is an expandable TV console (48″ to 72″) and a 2-piece Peninsula Desk that adds convenient work space to the wall. The best part? Parker House Entertainment Units can be assembled in a few hours. Say goodbye to the inconvenience of long construction hours and a floor full of sawdust! The bedroom is where one never stops dreaming. So why not give those dreams a comfy lil’ nook to nestle, where you can go back to them the minute your head touches the pillow? Make that dreamy journey in an elegant, fairytale-like Twin Sleigh Bed in white antique finish. 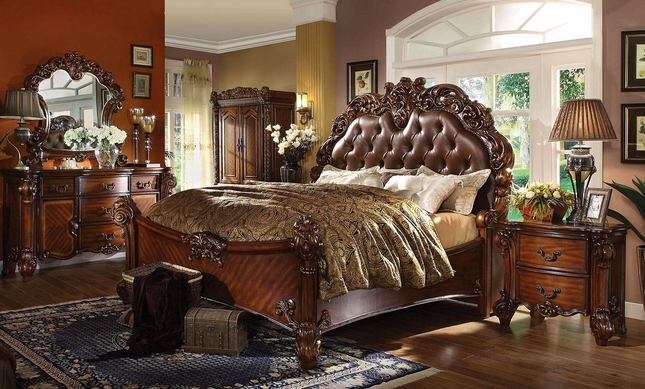 Or a royal welcome in an extravagant Caledonian Victorian-inspired poster canopy bed! Shop Factory Direct, the one-stop-shop for buying home furniture and home furnishings online, will leave you spoilt for choices. a) Aesthetic appeal: Consider this. A modern California King Bed from the Hudson contemporary collection, available on Shop Factory Direct. Matched perfectly with an oversized nightstand, dresser-mirror, chest and TV unit. All four pieces in a delightful expresso-finish! And just a click away, at great prices and free shipping. b) Time-saving: It takes time and energy to pick out every single piece of furniture for your bedroom. Bedroom Furniture Sets by Shop Factory Direct just made that task a whole lot easier with coordinated pieces of essentials for you, the working professional or preoccupied parent short on time. c) Variety: On Shop Factory Direct, choose from 200-plus options of Bedroom Sets (King & Queen) and 30-plus Bedroom Sets (Twin & Full). Go for trundle or day bed sets, that make best use of available space, and pick from as many styles – from antique and slatted headboard to rustic and beach cottage. The bouquet of brands includes the Villa Valencia collection by Michael Amini, Vendome Collection by Acme Furniture, Zachary and Ramses. What’s more? Each category offers the option to buy the complete 4-piece Bedroom Furniture Set or bundles (queen bed and dresser, for example). d) Affordable pricing and free shipping: Find beautiful bedroom bundles at attractive prices without compromising on craftsmanship and comfort. Shop Factory Direct offers free shipping across 48 states in the US… just the trump card your hand is looking for. Choosing white furniture can be a great option for any room in your home. Available in a variety of styles ranging from antique traditional to transitional or contemporary and everything in between, the use of white furniture can be used to brighten up any space. White furniture is great for blending and layering varying neutral colors to lighten up a space or to provide a stark contrast to darker colors used for walls and/or flooring. When shopping for white furniture, there are a few factors which should be considered. This article highlights some of these factors to help with selecting the furniture that is right for your home decor. White is a color, the perception of which is evoked by light that stimulates all three types of color sensitive cone cells in the human eye in equal amounts and with high brightness compared to the surroundings. A white visual stimulation will be void of hue and grayness. White is the lightest possible color. Shades of white are colors that differ slightly from pure white. Variations of white include what are commonly termed off-white colors, which may be considered part of a neutral color scheme. In color theory, a shade is a pure color mixed with black (or having a lower lightness). Strictly speaking, a “shade of white” would be a neutral gray. This article is also about off-white colors that vary from pure white in hue, and in chroma (also called saturation, or intensity). Colors often considered “shades of white” may include, among others, cream, eggshell, ivory, Navajo white, and vanilla. Even the lighting of a room, however, can cause a pure white to be perceived as off-white. There are also many other different names used to describe the variations or shades of white. Terms like pure white or snow white may be used to describe a brighter shade of white while terms such as off white, antique white, ivory, natural, bone and linen may be used to describe darker shades more closely resembling a tan or beige color. Keep in mind that digital images may vary in color depending on a number of factors including but not limited to individual computer monitor color settings, lighting and photography. The color of the actual items may vary slightly due to variations in the application technique or the color of the finish on wood products, dye lots on fabrics and leather as well as natural variations in wood grain, leather and stone. Therefore the item you receive may not be an exact match to what you see on your computer screen. Below is a digital image of a dining room set. Although it is the same image, some computer monitors may display the image on the left while others may show the image on the right. The image below shows the same dining set photographed with a camera phone. The image on the left and the image on the right are photos of the same dining set, in the same room, taken with the same camera phone. The variation in the color is due to a change in the lighting. Below is a great example of how photography and monitor settings can have a drastic affect on the look of a furniture collection. The image on the left is the same photograph as the one on the right. The image in the center was taken with a camera phone with different lighting. Lighting in a room plays a significant role in the perception of colors. Color is nothing more than a reflection of light, so the type and amount of light in a room can have an enormous impact on the color scheme of your room. For example, natural light will greatly differ from artificial light from lamps or recessed fixtures. The color of fabric, leather or furniture, walls and other surfaces can look very different by simply changing the light bulbs in lighting fixtures. Due to its uniform intensity over the visible spectrum of colors, daylight is considered to be the best source of light. Even the natural light of the sun changes from sunrise to sunset as it penetrates through varying amounts of atmosphere. This variation can also have an affect on the perception of different shades of white furniture. Incandescent lamps have a tendency to emit a warm, reddish or amber hue. This warmer light will make certain shades of white appear more cream or off white. In contrast, fluorescent lamps generally create a bluer, cooler light which will make the same piece of furniture appear brighter. Keep in mind that any shade of white furniture will reflect the colors that surround it. For example, the color of the walls, flooring and any other accessories will be reflected by the white surface of furnishings. Varying shades of white wood tones, fabrics and leather are perfectly acceptable in interior design as it creates a layered look. There is absolutely no reason that pieces of furniture need to be the exact same shade of white. In fact, exactly matching shades of white can create a more contrived look in a room while layering the room with varying shades of neutral colors will provide a more put together feel. HOT SEATS… AND ALL THE DEETS! Fab Festive Furniture From Shop Factory Direct!